Oriental and Persian rugs have enjoyed a long history which has permeated nearly every facet of numerous cultures around the world. Along with being recognized for the intricacy of their weaves, the luster of their dyes, and the boldness of their motifs, handwoven carpets have also played a role in accounts that speak to the profound admiration they have evoked in the hearts and minds of generations. Below are just three introductions to these wondrous tales. A compilation of Middle Eastern, West and South Asian narratives written in Arabic from the Islamic Golden Age, One Thousand and One Nights features a particularly memorable story of Prince Husain. It begins with the account of a Persian Prince who has a special fondness for marrying virgins – which he does every day during his reign – then having each beheaded the next morning to ensure their faithfulness. However, one wise maiden, Scheherazade, discovers a way to keep herself alive and on the throne in perpetuity. It begins with her telling of a story of how the Prince himself travels to India to obtain a carpet that can transport him anywhere in the world at the blink of an eye. Nevertheless, before retiring for the night, she tells the Prince she will continue the story the next day. That next evening, the Prince then inquired how the tale would resume, and for the next 1,001 nights Scheherazade told great fairytales of the Prince’s travels to far off lands, after which she admitted she had run out of stories to tell. But by then the prince was so thoroughly fascinated and entertained that her life was spared thereafter. King Solomon is well-known in the Bible and the Qur’an as being the King of Israel around the years 970 to 931 BCE. As King, Solomon had obtained a carpet made of green silk and a golden weft which covered an immense area of sixty miles in both length and width. 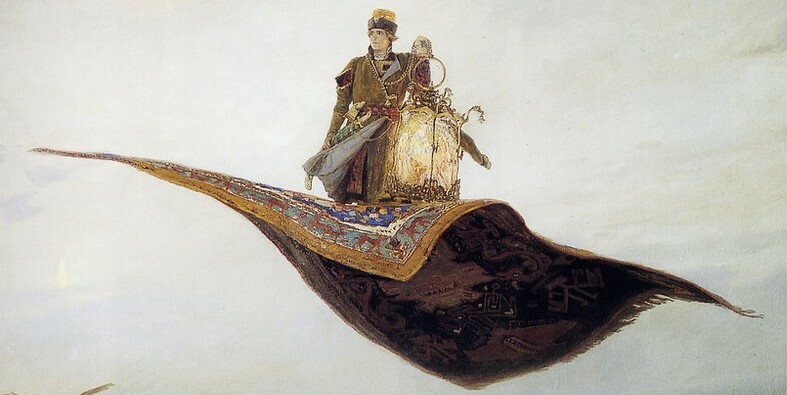 Shielded by a covering made of birds to keep it from being exposed to the sun, Solomon’s carpet held great power, because as Solomon sat upon it he could immediately be lifted up by the wind and carried to any destination he desired. Some of these destinations included having breakfast in Damascus and eating supper in Media. Before his death in 1910, the American writer Mark Twain wrote his final short story for Harper’s Magazine entitled Captain Stormfield’s Visit to Heaven, which appeared in December 1907 and January 1908. It told the tale of a sea captain’s death, who then rode through space on a comet for 30 years at one-fifth the speed of light before coming to the gates of Heaven. While there, he soon realized he was in the wrong area of Heaven and then used a wishing carpet to instantaneously transport him to his proper area of Heaven. From here, the story takes on largely spiritual themes, though lightly edged with the author’s sometimes more “common man” style of thinking, and themes that make profound statements on Twain’s own feelings on American culture. Likely borrowing from earlier tales, such as those mentioned above, Twain’s use of the magic wishing carpet continued the use of Oriental and Persian rugs in storytelling into the 20th century, where it has been used numerous times since in areas such as video games, movies and even J.K. Rowling’s Harry Potter series. Visit Ahdoot Oriental Rugs for yourself and experience the magic of handmade artistry today. We offer everything to begin your own journey into collecting these fine articles, as well as services to keep your rug looking its best, including repair, cleaning and appraisal.